Truth be told, I’m not a fan of black licorice. If I had to eat licorice I would choose the red (strawberry or cherry flavored) kind. This cake is stunning in its simple elegance – it’s just a stark white wedding cake adorned with black rope licorice and black polka dots created with royal icing. It’s gorgeous. And the tiny black licorice bows on the cake add just the right amount of whimsy to an otherwise elegant affair. This cake would be beautiful at a semi-formal or formal wedding. And if you want to kick it up a bit, think about using red licorice ropes. A red and white wedding cake? That would be amazing at a summer wedding! Another great thing about this wedding cake? It really can be a DIY project if you’re feeling a little ambitious! Check out the not-too-difficult instructions here. 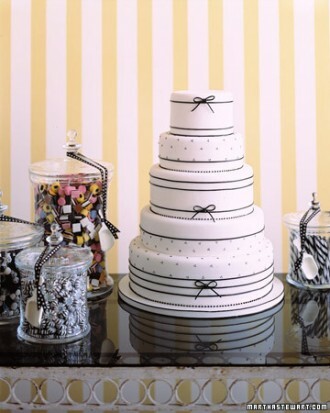 You can find this elegant licorice wedding cake here.